It has not been clearly demonstrated whether HIV vaccination can complicate routine HIV testing. In this report, we describe the laboratory data of two prisoners who received rgp120 vaccine in a phase III trial underway in Thailand. These data indicate that previous vaccination may complicate the interpretation of screening HIV diagnostic tests. The participants were identified from a cohort study on "Health factors related to HIV-1 and other viral infections among incarcerated people" that was approved by The Ethical Committee for Research in Human Subjects, Ministry of Public Health, Thailand. HIV diagnosis was definitively established with serial specimens using multi-screening tests, Western blot and diagnostic PCR. Anti-HIV screening tests consistently exhibited either weakly reactive or inconclusive results. The band patterns of the Western blot analysis corresponded to those found in individuals who received the rgp120 vaccination. Definite results were established using diagnostic PCR, which exhibited consistently negative results with follow-up specimens. Such problems in HIV testing are not easily resolved in the routine clinical setting in Thailand. These data demonstrate that HIV-1 vaccination interferes with routine diagnostic tests. Similar cases will not be uncommon in Thailand, where 2,545 people have already participated in a phase III trial. At present, there is only one protective human immunodeficiency virus type 1 (HIV-1) vaccine undergoing phase III trials. [1, 2] In 1998, the phase I/II trial was conducted among 33 injecting drug users in Bangkok, Thailand, using rgp 120 derived from HIV 1 subtype B (MN). The preliminary data of the phase I/II trials demonstrated acceptable safety and immunogenicity, with some breakthrough infections. Then, a randomized (ratio1: 1), double-blind, placebo-controlled phase III trial, using a bivalent rgp 120 vaccine derived from subtype B (MN) and subtype E (244), was initiated in March 1999, in Bangkok, Thailand, with 2,545 injecting drug users. The final result on the efficacy of this vaccine may be expected in late 2003. Indeed, almost 100% of vaccinated individual seroconverted following immunization and developed a high antibody titer. [3, 4] The development of antibody following vaccination would be predicted to interfere with anti-HIV screening tests but there are few reports describing such complications. [5–7] In the trials, vaccinated individuals are distinguished from HIV infected cases by nucleic acid tests such as PCR. [4, 8, 9] However, it is questionable whether or not the technique of PCR can be routinely implemented in the trial sites. In this report, we present data derived from two vaccinated individuals whose vaccination history was not known before inconclusive anti-HIV test results were observed. The confounding effects of vaccination upon subsequent HIV testing are discussed and recommendations suggested. The two cases reported were male prisoners selected from among 689 participants in a study on health factors related to HIV-1 and other viral infections among incarcerated people. The study was reviewed and approved in 2001 by The Ethical Review Committee for Research in Human Subjects, Ministry of Public Health, Thailand. Participants received a thorough explanation of the study, including the risks and benefits, and gave signed informed consent prior to entry into the study. Patients were visited monthly during the 6-month period of follow-up. At each visit, the participants were interviewed regarding their risk behaviors, received pre-test or post-test counseling and gave samples for laboratory tests. HIV diagnosis was established by a combination of screening tests as recommended by the WHO and Ministry of Public Health, Thailand. HIV-1 antibody testing was performed with a two enzyme immunoassay (EIA) using Uni-Form II Ag/Ab (Organon Technika) and HIV1/2 gr. O EIA (Abbott laboratories) together with a gel particle agglutination test (GPA, Fugirebio Inc.). Positive anti-HIV results were reported after concordant reactive results were observed. In the case of discordant results from these screening tests, the specimens underwent Western blot analysis (HIV blot 2.2, Genelabs diagnostic) and HIV-1 RNA and DNA were detected by in-house PCR as described in a previous report. KP 548 and KP 667 were heroin users (by injection) since 1991 (KP 548) and 1994 (KP 667). They had shared needles before and during incarceration. In addition, KP 667 shared needles with two HIV-infected prisoners. However, both KP 548 and KP 667 were anti-HIV negative in the latest tests undertaken in 2001. The results of screening tests on KP 548 and KP 667 were consistently discordant at the first visit and 2, 8 and 14 weeks later. 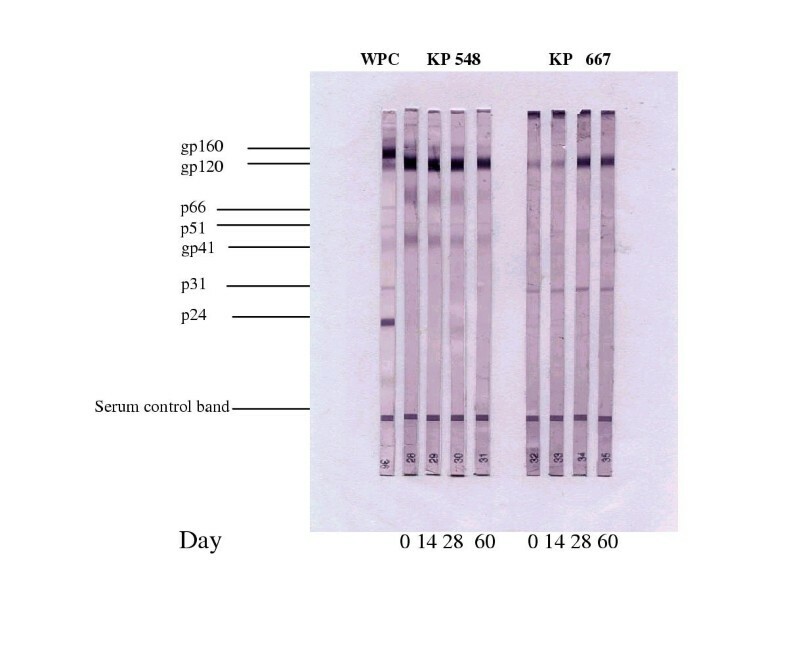 All specimens were analyzed by Western blot that demonstrated unique high intensities of gp120 but minor or undetectable gp160. Such Western blot banding patterns were not found in any HIV-1 infected cases. After analysis of the serial specimens, the serological test results remained inconclusive and indeterminate Both RT-PCR and DNA PCR for HIV-1 were consistently negative in all the samples. The history of vaccination was elicited at the fourth visit after a 2-month period of follow-up. Detailed laboratory data is illustrated in Table 1.
day after first visit; ** EIA1, Vironostika, Uni-Form II Ag/Ab ; *** EIA2, Abbott HIV1/2 gr O EIA; GPA, Gel particle agglutination; WB, Western blot; Pos, Positive result; Neg, Negative result; NR, non-reactive; index, OD/Cutoff value; ID, Indeterminate result; 1+ to 4+, relative intensities of bands in WB as compared to those of weakly reactive control; Interpretation criteria for positive WB was the presence of 2 envelopes +/- gag +/- pol, as recommended by the manufacturer. KP548 and KP667 were two out of 2,545 individuals involved in a phase III trial in Thailand. Their clinical specimens were tested for HIV-1 infection using the same test algorithm used for routine individual diagnostic specimen testing. Their vaccination history was not known since such data was not included in both the questionnaire and the pre-test counseling but was discovered by the laboratory test results and was confirmed by retrospective interviewing of the cases. Thus, a vaccination history should be included in the standard pre-test counseling both for diagnosis and blood safety. Secondly, the vaccine induced antibody response can complicate anti-HIV-1 screening tests. Similar complications were observed among vaccinees in the phase I/II trial. The vaccine had induced antibody that was detectable by EIAs and Western blot. The extent of reactivity of the tests was depended on antigenic determinants of the tests and the vaccines. [6, 7] The weakly reactive EIA and discordant screening test results were similar to those of early seroconverters. However, the follow-up testing exhibited stable signals in the EIA and Western blot, while those of early seroconverters should be increasing. Thirdly, the Western blot results were incorrectly reported as anti-HIV positive if the band intensities were not scored. As demonstrated in Figure 1, the intensities of gp120 were significantly higher than the intensities of gp160. Such relative intensities were not observed in any HIV-1 infected cases. Finally, the definite diagnosis was obtained after PCR testing of serial specimens. However, PCR testing is not available or affordable for all laboratories in Thailand, except in the case of a few research settings. Furthermore, such viral genome detection test is prone to contamination as demonstrated in a vaccinee who got repeatedly false positive HIV RT-PCR. These two cases demonstrate the potential impact of HIV vaccination on the laboratory diagnosis of HIV in all places where people have access to HIV vaccines. Another complication of HIV vaccine trial is trial-related discrimination that occurred at 5% of the volunteers. Among these events, 10% was reported to be linked with HIV testing. The design of efficacy trial of new HIV vaccines should be in parallel with development of novel diagnostic tests that are capable of differentiating between immunization and true HIV infection. The authors would like to thank all of the staff of the Department of Corrections, Ministry of Interior, Thailand, for their excellent cooperation. The study was supported by the Annual Budget, Thai government. The patients gave their informed consent for the publication of their data as indicated in the ethical approved protocol.